The civil war exhibited one of the classic hyperinflations of history with confederate notes becoming worthless by the end of the war. But interestingly inflation was not a straight line to infinity. Confederate notes provided an excellent lesson in how money supply affects currency value. 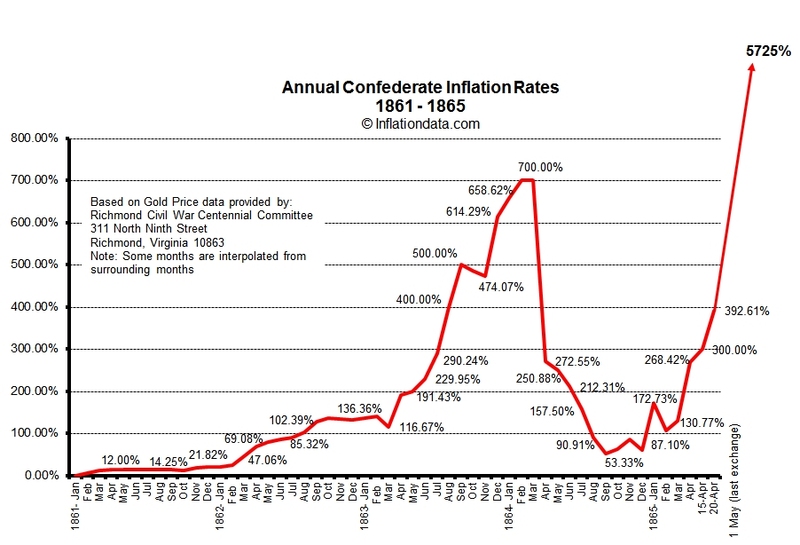 The Chart below shows the Annualized Confederate Inflation Rate. The Annual Inflation Rates are calculated from information provided by the Richmond Civil War Centennial Committee on the purchasing power of Confederate Notes. Dollars to buy one Gold Dollar or 200% inflation since 1861 but because inflation is generally measured Annually we have to compare the price to the price a year earlier. So from $1.25 to $3.00 is 140% inflation. According to the San José State University Department of Economics from October of 1861 to March of 1864 the commodity price index rose an average rate of 10 percent per month. When the Civil War ended in April 1865 the cost of living in the South was 92 times what it was before the war started. This inflation was obviously caused by the expansion of the money supply. The role of the money supply in establishing the price level is confirmed even more strongly by the results of an attempt to curb the growth of the money supply in 1864. To calculate current inflation rates try our Inflation Calculator.